Equity crowdfunding: A new model for financing entrepreneurship? Entrepreneurship and the growth of small firms (SMEs) are recognised to be essential for economic growthand employment creation. Yet despite their key role in entrepreneurs find it hard to access the ﬁnance they need to survive and grow. Lack of funding opportunities is a major constraint on new venture growth. Moreover, traditional venture capital markets have been criticised in terms of their inclusivity; there have been suggestions of regional, gender and ethnic biases. In the past few years, the UK has been a leader in fostering an entirely novel mechanism for raising capital for entrepreneurs. Crowdfunding is a financial innovation based on the use of social media to exploit investor and entrepreneur networks. Media and research attention has focused on gift-type crowdfunders, where artists receive money from their social network in exchange for rewards associated with the product itself, for example free tickets and meetings with the artists in return for funding albums or films via platforms like Kickstarter. However, of much greater significance for capital starved entrepreneurs is equity crowdfunding, which offers founders of new ventures an on-line social media marketplace where they can access a large number of investors who, in turn, each supply funds to finance initiatives that they find attractive. The UK permitted equity crowdfunding (eCF) since around 2010 and the sector has seen remarkable growth. Between 2011 and 2015, it grew from £4 million to £3000 million, in a total UK alternative finance market estimated at £1.3 billion (FT 6/10/15). The growth is indicated by the development of Crowdcube, the largest UK equity crowdfunding platform. It funded only 22 firms raising £2.5m in 2011. That increased to 54 firms and £12m in its second year and more than £20m in its third. Nearly five years after it began, the company has now passed the £100 million investment mark with hundreds of entrepreneurial ventures financed. Unlike in donation or reward based crowdfunding, eCF investments are not necessarily small and there are not necessarily large numbers of investors. Individual lead investments in pitches are routinely between £100,000- £200,000 and, depending on the model that the eCF platform follows, average investments are between £1,000 and £3,000, while minimum investments of £10 remain popular. 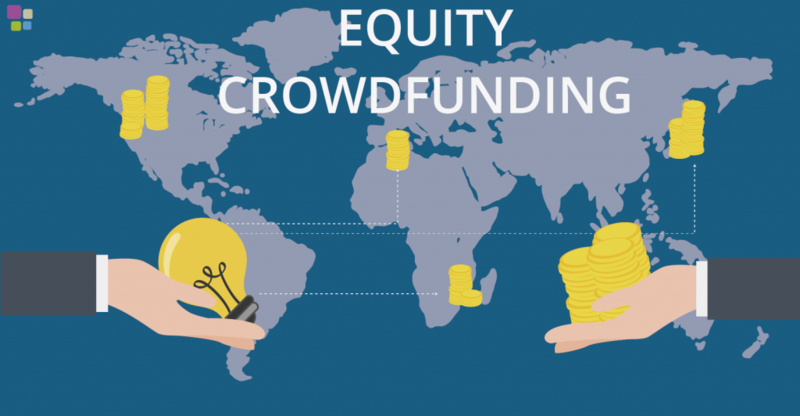 Despite its rapid expansion in the UK, under the gaze of a sympathetic financial regulator, observers continue to raise concerns about equity crowdfunding as a financial innovation. Does eCF represent a danger for investors because of poorly explained risks? Aren’t investors likely to invest irrationally through herding within the crowd? What possibilities of fraud are there? To answer these questions we have been working closely with Crowdcube, one of the larger UK players, and we have developed detailed real-time information on the choices of 150,000 platform members and more than 7,000 entrepreneurs of whom 735 have pitched on the platform to raise funds. Our analysis shows that this new virtual market has operated in a relatively stable and predictable manner through its period of early emergence as an alternative source of entrepreneurial finance. To be precise, we find that investment choices are significantly influenced by information from the platform about entrepreneurial quality and the venture’s price for its equity. Furthermore we find it is the platform’s architecture and the design of its processes that explain the success of equity crowdfunding in filling the equity gap. How does it work? An eCF platform has two networks, one of investors and the other of entrepreneurs. Investors on the platform include professional early stage investors, sector specialists, angels and venture capitalists, as well as potential small investors. Moreover, an offer to supply funds is only taken up if the pitch itself is successful. Thus, whether or not the entrepreneurial project is funded is determined through the platform bidding mechanism but is not under the control of the individual players themselves. Entrepreneurs bid for funding by making pitches to the network. Qualitative evidence suggest that admission to pitching is a fairly closely screened process; in practice on Crowdcube only about 10% of the entrepreneurs seeking to make pitches are allowed to do so by the platform. and on average 30% are successful. To enter a pitch, the entrepreneur has to state a sum that they seek to raise, the amount requested, and the number (proportion) of shares that they will offer in return for the investment. Thus, they are implicitly providing a valuation of their business. On Crowdcube, but not necessarily all platforms, entrepreneurs can set a level of investment whereby successful investors will receive A shares (voting rights), rather than B shares. They also have to provide financial information about the company, following a standard format, including information about themselves and their business experience and an explanation of their business idea. They have to provide a video of themselves outlining their pitch to potential investors. Once accepted, a pitch is usually live on the platform for a fixed period, currently 45 days in the case of Crowdcube. During the pitch there is an exchange of information and data around the network, between bidding investors as well as between entrepreneurs and investors. This is the process whereby the knowledge within the network (the “crowd”) is disseminated. There are three possible outcomes to a pitch. It fails to accumulate by the bids (actions) of individual investors the amount requested in which case potential investors in this pitch as a group are not able to make an investment. Our data show that this occurs in the majority of cases. Second, the cumulated amount invested exactly equals the amount requested, in which case the pitch is funded. Finally, the cumulative sum available for investment exceeds the amount requested. In this case, the entrepreneur receives the additional amount and the proportion of shares supplied are increased (from the entrepreneurs own holding) but not in proportion to the overfunding, thereby also diluting the holding of all bidders also. In practice on Crowdcube, only about 30% of pitches are successful. So do investors follow the herd by stampeding into popular pitches and investing irrationally in eCF? Analysis of the data from our unique proprietary dataset allows us to look at two aspects of investor behaviour; the supply of funds within a pitch, and whether or not a pitch is funded through the crowdfunding process. We found that in fact information accumulates through the pitch process, with each incremental investment acting to provide additional information, visible to all other potential investors, about how the pitch is currently evaluated. However the impact of other investor actions does not generate unstable or explosive investment paths. One pound invested on one day of the pitch generates an additional 51 pence in the subsequent day, and an additional 76 pence over five days. The lagged effects taper quickly, suggesting fairly rapid absorption of the incremental information driving the initial new investment and since the sum of the lagged effects is less than unity, the impact of fresh investment is not unstable. In terms of the likelihood that a pitch is successful in receiving funding, we find that easily available information in the public domain about the entrepreneur and the firm, such as the sector or location of the business or the gender of the entrepreneur, do not have a significant influence on the likelihood that a pitch is financed. On the other hand, information that the entrepreneur must reveal in order to enter the pitch process, notably the price and number of shares on offer, setting the company valuation, and the current size and prospective growth of the firm in the future, do have the expected impact on pitch outcomes and these effects are statistically significant. For example, as the valuation rises, the likelihood that a pitch will be funded declines. In sum, we show that when entrepreneurs and investors exchange (positive) signals about themselves and their ventures on the platform, the effect is to increase the supply of funds and to increase the chances that their pitch will be funded. Moreover, this new virtual market acts to improve the flows of information between investors and entrepreneurs and to reduce the biases and location limits on funding typical of traditional forms of early stage entrepreneurial finance. We therefore suggest that the architecture of equity crowdfunding platforms such as those of which Crowdcube is an example is able to exploit the low transactions costs characteristic of its online environment and to bring increasing network effects to bear on investor decisions in early stage entrepreneurial finance. Thus, by moving from the physical to the digital space, eCF engages larger networks of entrepreneurs and investors, creating an opportunity to solve the persistent market failures in funding entrepreneurial ventures. In the process, as equity crowdfunding offers an entry point for investors across demographies and geographies, it may also socialize entrepreneurial finance.